2 kids, 2 dads in the birthplace of the Republican Party! You know this is going to be interesting! 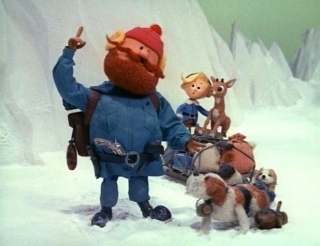 Ever since I can remember, I have loved the Christmas special “Rudolph the Red Nosed Reindeer.” Never mind the fact that we both dropped in 1964 and it features a burly red head with a St. Bernard, the show is a classic on many levels. I have noticed that a lot of my LGBT friends are into the show as well, and I think it’s because of its endearing story and great characters. But there is more than that. It tells the tale of a group of outsiders, misfits as they’re known in the show, and for many of us; it paralleled our own lives as LGBT men and women, especially growing up. I remember hating gym in school, and the coach reindeer at the beginning of the show mirrored exactly what I endured with all my misguided gym teachers through elementary school. Hermey, the fey and dentally fixated elf pines for a better life as a dentist somewhere other than the North Pole while Yukon (the inspiration for our dog’s name) lives life as an outsider in the great white north. And then there is the Island of Misfit Toys. So much of that whole concept connects with me, because when AIDS first came out in the 80’s, there was talk from the ultra-conservatives to round up and isolate the Gays so that the disease wouldn’t spread. For a long time, as a young man, I worried that I might end up on my own little island due to who I loved and my misconceived status as a misfit just because I was gay. But just like in the show, the misfits band together and make their own family, a family born out of rejection and hatred but ultimately joined in love. Our friend Michelle once sent us a Christmas card that read: Friends are the family you chose. I couldn’t agree more! With all this talk of bullying and harassment lately, this show has a great message of acceptance and unconditional love. I may be a misfit in some people’s eyes, but I am a happy misfit. I think misfits, freethinkers, and iconoclasts of many stripes love it, as do I. However, one part of me does not: the female part. Watching it this year with my own little girl, I was struck again by how horribly sexist it is. We found ourselves critiquing the story out loud to our daughter as we watched it. The girl reindeer don't participate in reindeer games not by virtue of their noses but their genders. They don't pull Santa's sleigh. Donner's unnamed wife is told not to go out and search for Rudolph when he's missing, as that's a man's job. Even the island of Misfit Toys is completely ruled by male characters. I think everyone can relate to the Island of Misfit toys, even a little. It's what makes Rudolph such a classic. Gorgeous family picture, by the way. oh man, I love this post. Interesting! I never saw it. I'll try getting it for my son (and well, myself). Great post, Tom! I remember, 16 years ago, a student telling me I was weird and when I responded, "I know, isn't it great! I can act how I want and get away with it!" she took my hand and smiled. Yay for the misfits who embrace their misfitness! Finally going to Where the Wild Things Are!